Not a lot of strong forex trends this week, so this time I got my sights on a small range play on EUR/USD. What do you think? 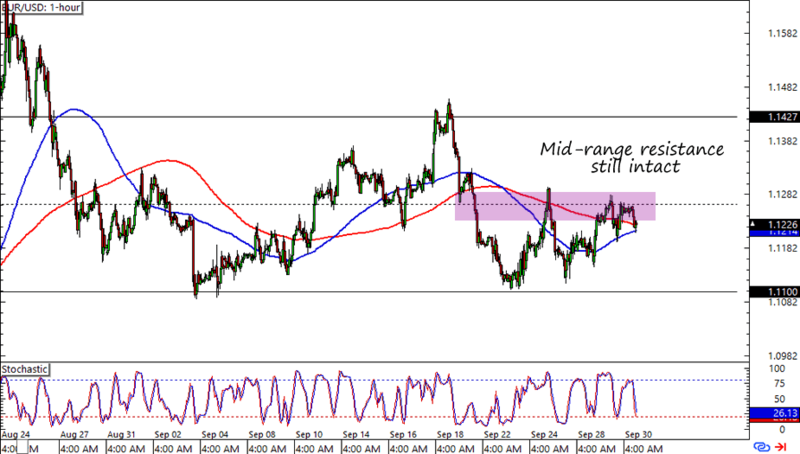 As you can see on the chart, EUR/USD’s 1.1275 area is still holding as resistance. This isn’t surprising since it’s also right smack at the mid-range level on the 1-hour time frame. The pair’s fundamentals is also making it easy for us to short it. For the past couple of days we’ve heard from different Fed officials, who mostly seem to favor a rate hike some time this year. Remember that the Fed only has two meetings, one in October and one in December, scheduled this year. Meanwhile, the euro is having trouble gaining support from the euro zone’s slight data misses. Not only that, but Draghi even recently hinted at possibly more QE from the ECB. Talk about contrasting policies! A short trade at around the 1.1250 area is looking like a good idea especially if we put a tight stop loss above the mid-range resistance. A target at 1.1100 presents a nice reward-to-risk ratio if you think the pair will reach the level. What do you think? Will EUR/USD’s mid-range level once again hold or will new catalysts push it towards its range resistance somewhere around 1.1430? Lemme know what you think!